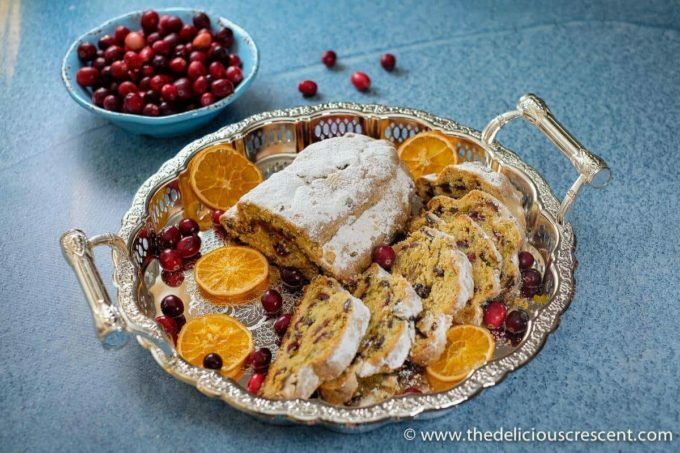 Cranberry Orange Quark Stollen, a much easier and quicker stollen recipe is so scrumptious and moist. It is packed with dried fruits, nuts and infused with a variety of flavors. With recommendations for using less sugar and butter. Step by step photos at end of post. 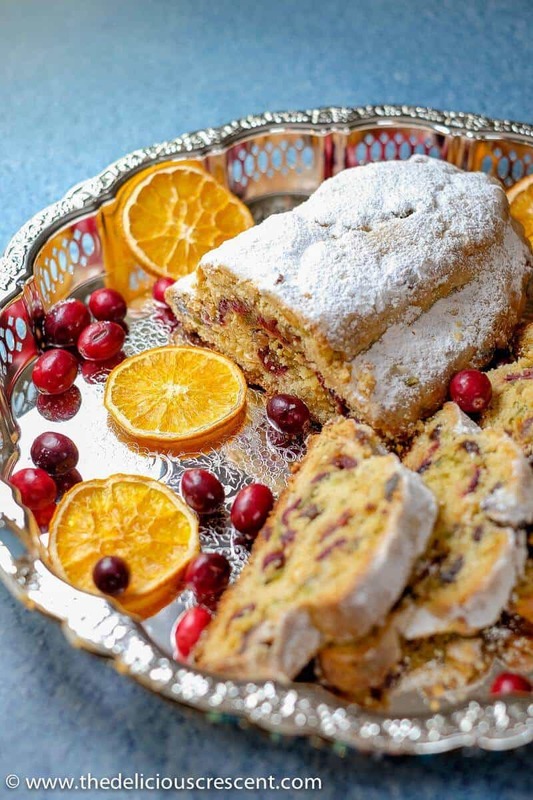 Stollen is a traditional German cake-like bread, typically made with flour, yeast, sugar, butter, flavors, spices, dried fruits and nuts. It is a sweet rich bread that has earned world wide popularity. But outside of Germany few people make stollen at home. And making the yeast based stollen recipe may seem cumbersome in cultures that don’t have too many yeast based cake recipes like they have in German cuisine. But quark stollen is a much easier and quicker recipe that is not yeast based and does not require the long proofing and waiting time. 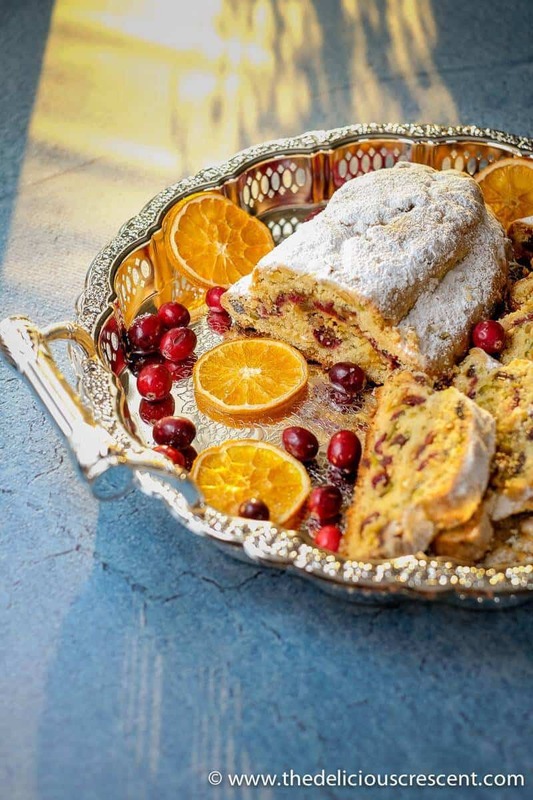 So with this recipe you can make your own homemade stollen! Quark is a soured milk cheese popular in German cuisine and is not easily available everywhere. However, it can be substituted with a combination of ricotta cheese and sour cream. In the recipe here I have used homemade sweetened cranberries and dried oranges, which is not traditionally German, but reflects a popular flavor combination in the US. 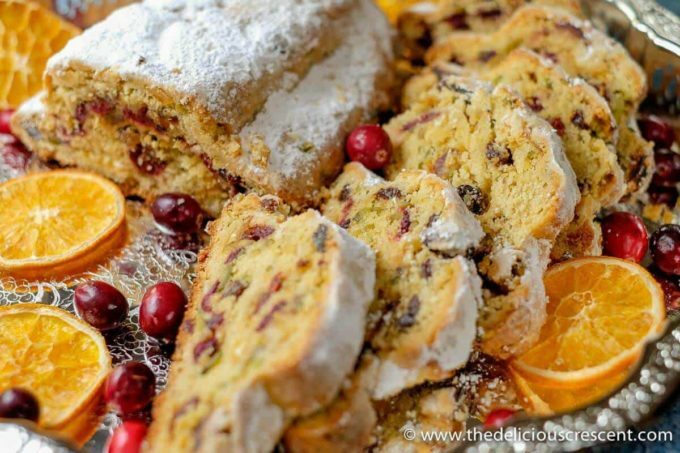 Stollen tastes very rich but actually requires less added sugar than most other decadent cake recipes. Much of the sweetness comes from the dried fruits that this delectable sweet bread is packed with. In the recipe here, I prepared sweetened cranberries using fresh berries and honey, which cuts down the added sugar significantly. Plus the berries stay more moist and look marvelous. I have also used dried orange segments, as I like to put my food dehydrator to multiple uses! If you like to dry your own fruit this is a good option. And I tried the recipe by replacing half the butter with light olive oil when making the dough itself. It did not make a significant change in the overall flavor profile. But the final buttery and sugary coating on the top of the quark stollen is critical to its characteristic taste. So there I do use brown butter with some powdered sugar. You may use plain butter if you wish, but I think that brown butter is more flavorful. 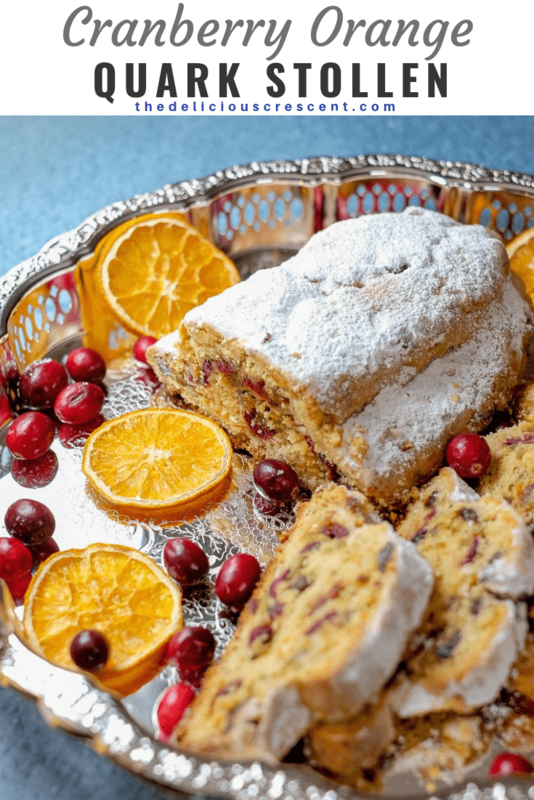 When you eat a piece of stollen, the first thing to hit your palate is that buttery sugary coating that tricks you into a feeling of eating something that is a lot more sugary and buttery than what the item is as a whole. Because the coating encompasses a dough that uses much less sugar than other rich cakes. Cranberries are high in nutrients and antioxidants including fiber, vitamin C, vitamin K, vitamin E and manganese. They are known for health benefits such as improved immune function, cancer prevention, decreased blood pressure and low risk of urinary tract infections. The store bought dried cranberries are too sweet and have a lot of refined sugar in them. I make my own and doing that lowers the added and refined sugar significantly. I simply mix some cranberries with honey or maple syrup and bake them for about half hour. Some juices are released around the berries. But I typically leave the baked berries on the baking sheet for a day and then slowly loosen them using a fork. If you use dried cranberries make sure to soak them to soften them. If needed, you may substitute the dried orange segments with store bought candied orange or orange peel. Traditionally the dried fruits are soaked in rum overnight. Since I do not use rum, I have used orange juice instead. Using a combination of orange juice and non-alcoholic rum extract is one possibility. Using metric measures is more accurate for baking. If using cup measures, make sure to unpack the flour and almond meal and spoon it into the measuring cup. Preferably use grass fed butter. The coating on top of the quark stollen keeps this fruit bread moist. Make it ahead and wrap it for at least 2 weeks and up to 4 weeks before serving. The stollen needs to ripen for at least 3 weeks to develop its optimal flavor and texture. This post was first published on 21st december, 2017 and has been updated. Rinse the fresh cranberries and blot them dry with a paper towel. Add the honey and stir well to coat the cranberries. Spread the berries out on a parchment paper lined baking sheet and bake at 350 degrees F for half hour. Ideally let the baked cranberries rest a day and loosen them out using a fork. Tip: Can use ready made dried cranberries. Soak the raisins in orange juice, preferably overnight or at least several hours. Next, stir in the chopped dates, dried orange, candied peel with the soaked raisins and set aside. Tip: Can use ready made candied orange or orange peel instead of dried orange. Sift the flour with the baking powder into the mixing bowl of a stand mixer. Then add almond meal, sugar, salt, vanilla, almond flavor, spices, orange zest, quark, olive oil, butter, and egg. Using the kneading attachment process the ingredients at a low setting until just combined. Then advance to the higher setting and knead for 5 minutes. Tip: Alternatively you may knead the dough by hand for about 5 minutes. Next add the pistachios and the soaked dried fruits and knead it into the dough until just incorporated. Tip: Don't overdo the kneading at this step. Using a rolling pin or your hand, shape the dough into a 8 x 10 inch rectangle. If needed, use little bit of extra flour to aid with dusting the surface while shaping the stollen. Scatter the cranberries evenly over the rolled out stollen dough. Then carefully roll it up into a tight log that is about 10 inches long. Using both hands make a lengthwise depression on either side of the log to create a middle section that is slightly elevated, with the sides tapering off. Transfer the shaped quark stollen dough carefully to a baking sheet that is lined with parchment paper. Bake in an oven that has been first preheated to 400 degrees F. After placing the dough in the oven lower the temperature to 325 degrees F and bake for about 45 to 55 minutes until the stollen is golden brown. As soon as the stollen is taken out of the oven, brush it with melted brown butter and dust with powdered sugar. Repeat the process two to three more times. When it is completely cooled off, wrap the quark stollen twice with baking paper or cling wrap and then in foil and store for at least 2 weeks or more before slicing and serving. Make dried sweetened cranberries in the oven (can use ready made). Soak raisins in orange juice. Add all dried fruit and soak in orange juice. Sift flour with baking powder. Add remaining dough ingredients into the mixing bowl and knead the dough. Add the soaked (but drained) dried fruit to the dough and knead lightly. Roll it out into a rectangle. Scatter dried cranberries over the dough and roll it tight. Then form the stollen shape and bake. Brush the stollen, hot out of the oven, with melted butter and dust with powdered sugar. Yes, Prasanna the orange flavors work so well with rest of the ingredients. This looks fantastic! I love the step by step photos. Can’t wait to try this! I keep meaning to try quark in my baking, as it looks like a good way to save some calories. The flavours in this sound lovely. Thanks Dannii. You make a good observation about the nutrition aspects of quark. It definitely is a great option for baking. Gives some moist cakes and it is lower in cals, carbs than other alternatives used in baking. I tried to tackle 2 different kinds of stollen before, the traditional quark and butter stollen with lots of dried fruits & fruit peels. Though I tweaked them a bit adding the combination of spices. Thanks for sharing your recipe. Thanks Calleigh for sharing your experience making the recipes. How wonderful!! My grandmother who was German, made a lot of German dishes! I remember her stollen! I wonder if she made quark stollen, but I was young and didn’t pay much attention! 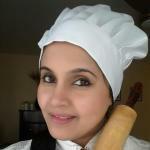 I will be trying your beautiful and delicious recipe real soon!